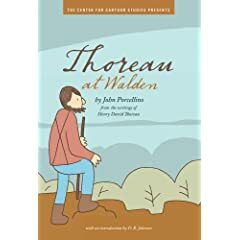 Thoreau at Walden distills Henry David Thoreau's life and philosophies into a deceptively simple to read graphic novel. John Porcellino's delicate line drawings are as big a part of Thoreau's story as the text, capturing the moments with beauty and charm. Perhaps the book's greatest asset is its varied audience, both children and adults will appreciate this wonderful, slim volume. My next book is Potential, by Aeriel Schrag.